LONDON (Thomson Reuters Foundation) – Last week, 250 children at five London primary schools have carried backpacks that monitor air quality for a university-led study tracking pollution levels on their daily journeys. The initiative is the latest stage of the Breathe London project, which London Mayor Sadiq Khan’s office described as “the most comprehensive city-wide network of air quality monitors of its kind in the world”. A 2017 study by consultancy Aether for the Greater London Authority, using 2013 data, found that a quarter of all schools across London were exposed to air pollution levels that exceeded European Union limits for nitrogen dioxide (NO2). In Greenwich, southeast London, Haimo Primary School – which is participating in the Breathe London scheme – incorporates education about the environment into its curriculum, head teacher Kate Barnes told the Thomson Reuters Foundation. “Our children are on the playground at lunchtime, running around, breathing in this air – and it’s not okay,” she said. After two years of petitioning, last autumn the school council was able to implement a “school street”, meaning the road is closed at the beginning and end of the day, Barnes said. That has led to a significant drop in parents driving their children to school, and rising use of clean air-friendly modes of transport like walking and scooting, she added. Combined with a focus on the world’s sustainable development goals in class, Haimo pupils are learning about the effects of climate change – and what they can do to combat it, Barnes said. In the week-long experiment, which began on Monday, students have worn the specially adapted backpacks containing sensors – developed by Dyson engineers and King’s College London – to measure particulate matter and NO2 levels in the air. The backpacks, which weigh just over 1kg, switch on and off automatically – running from 6am to 11am, and 2pm to 8pm – and can be worn like a normal school bag with plenty of room for books and lunch boxes, Barnes said. The data collected will allow researchers to gain a better understanding of the most harmful air pollutants, their origins, and when and where they are highest, said Benjamin Barratt, a lecturer in air quality science at King’s College London. That will help support improvements in public health, for example, by encouraging people to walk or cycle places with their children instead of going by car, he said. “Air pollution has been found to restrict lung growth in children,” Mr Barratt said in a statement on the project. Poor lung function while young can persist into adulthood and is often associated with more serious health issues later in life, such as chronic obstructive lung disease, he said. Earlier this month, the United Nations said air pollution should be viewed as a human rights issue, with the problem causing 7 million premature deaths a year around the world, including 600,000 among children. The mother of Ella Kissi-Debrah, who died in 2013 aged nine following several seizures, applied for a new inquest at the High Court last month, with fresh evidence linking her daughter’s death to illegal levels of air pollution found near their London home, the BBC reported. An individual death has never before been directly attributed to air pollution, it said. 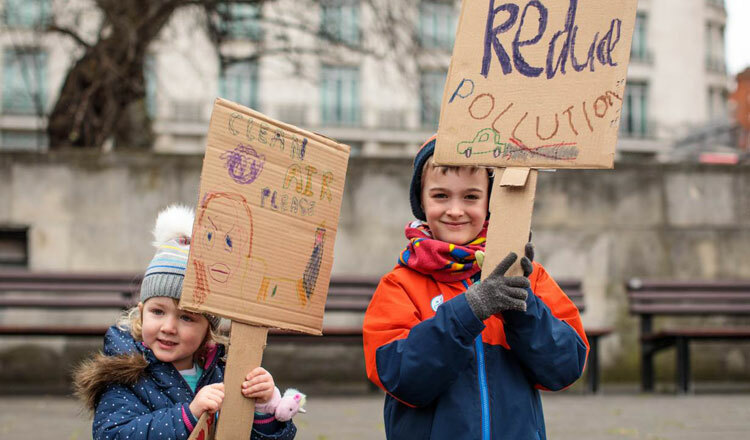 Last weekend, the British branch of the UN children’s agency, Unicef UK, held rallies in London, Birmingham and Manchester to highlight how strongly local children, families and campaigners feel about the issue of toxic air in cities. A third of children across Britain are breathing in illegal levels of air pollution, with the figure rising to about 75 percent in the cities where demonstrations were held, said Becky Dallison, Unicef UK campaigns manager. More than 2,000 schools and nurseries in England and Wales are located close to roads with illegal levels of pollution, and by 2035, air pollution-related health costs could exceed 5 billion pounds ($6.56 billion) in Britain, the agency warned. The British government has pledged to fight air pollution and introduce new legislation this year on air quality to save lives and billions of pounds for the economy. London Mayor Khan said he hoped the school backpack initiative would serve as a blueprint for other cities around the globe “as they battle their own toxic air emergencies”. The Breathe London project, devised by City Hall and the C40 alliance of cities working to tackle climate change, also includes more than 100 fixed monitors and the deployment of air-quality monitoring cars on the streets of London. “An issue this large and complex requires bold and innovative action to protect future generations and ensure our children breathe cleaner, healthier air,” Mr Khan said.